I was thinking about how to live above my circumstances. I know about Paul having learned how to be content in whatever circumstances he found himself in (Philippians 4:11). I am not there yet. I have 1 Thessalonians 5:18 “give thanks in all circumstances; for this is God’s will for you in Christ Jesus” on my wall, I see it every day. I am there sometimes. How can I give thanks for all my afflictions when they are causing me pain, fatigue and weariness? 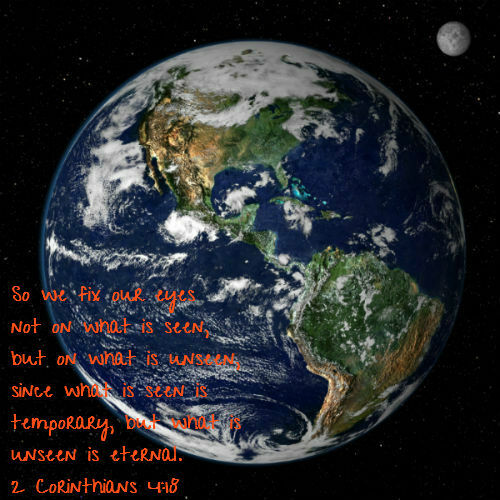 I asked the Lord that question and this verse came to me: 2 Corinthians 4:18 “So we fix our eyes not on what is seen, but on what is unseen, since what is seen is temporary, but what is unseen is eternal”. Ok Lord I got it, keep my eyes on You! Peter walked on water towards Jesus. When he started noticing the wind, he got fearful (circumstances) and he started going down (Matthew 14:28-30). How many times have I done exactly that very thing and gotten discouraged? Too many times to count! So, how do you live above your circumstances? First, thank the Lord for what He has allowed. In doing this you are acknowledging His Sovereign control. Everything that you go through is a growth opportunity. It is up to you what you do with it. It is easy to choose to be bitter and resent your trial or you can choose to embrace your chance to grow. Ask the Lord what He desires that you learn. Remember what Lamentations 3:32-33 says “Though he brings grief, he will show compassion, so great is his unfailing love. For he does not willingly bring affliction or grief to anyone.” The Lord will show you what He wants you to work on. Trust He has your good in His plan because He does (Romans 8:28)! Grow in your understanding that the Lord loves you too much to leave you a baby in your faith. Grow in trusting Him, He won’t leave you alone to face your difficult circumstances. I can testify to all these things. Finally, keep your eyes, heart and mind on what is unseen…Jesus.